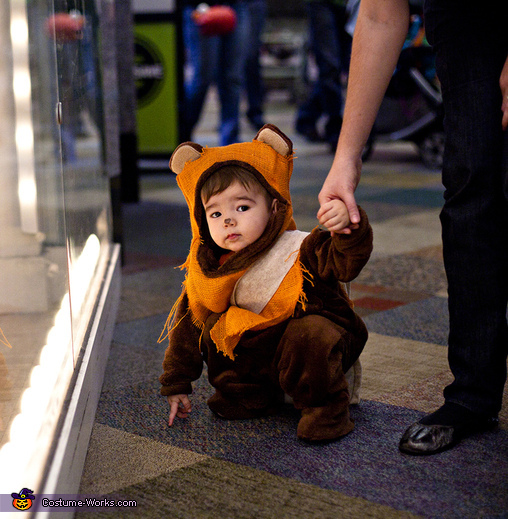 Ewok Toddler stops for a rest. I made this Ewok (from Star Wars) costume for our 18 month old son. I bought a monkey hooded throw for $10 and used the brown fuzzy material and monkey ears to form the bear part of the costume (by sewing it). Then, I bought some ratty orange fabric for $3 to form the hood. I also used some beige felt to make a little sling bag for his candy. The ewok was my husband's idea. I would love to purchase this costume for my 18 month old! This is the coolest costume I've ever seen. Great job!